Public Art enlivens, enriches and enhances our visual environment and public spaces. The best public art creates a focal point for activity, a meeting place or a landmark -- and lets residents and visitors enjoy the tremendous creative talent found in our city. 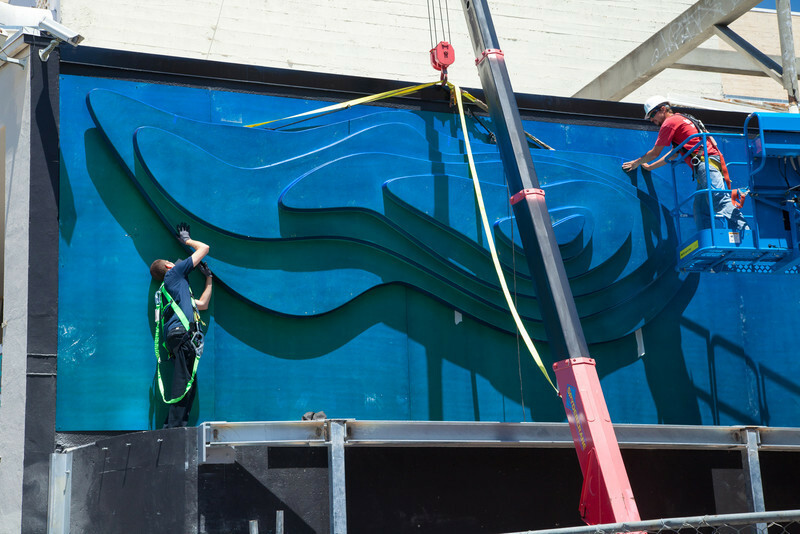 The City of Oakland's Public Art Program commissions original works of art for public spaces throughout Oakland. The program enriches the city’s visual environment, integrates the creative thinking of artists into public construction projects, and provides a means for citizens and visitors to enjoy and experience cultural diversity. Public Art projects are funded through a 1.5% allocation from all eligible City of Oakland capital improvement projects, eligible grant revenue as well as private contributions. 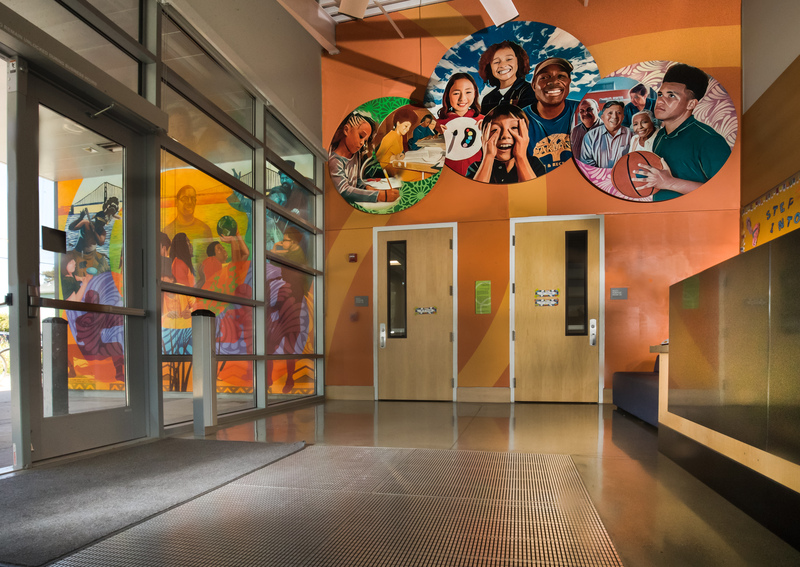 The recently completed Joining Circles celebrates the circles of friends, family and community that come together in this North Oakland recreation center. The artists incorporated images of community users and historical figures to introduce the cultural roots of the Golden Gate neighborhood to newcomers and frequent visitors alike, through permanent artwork included at the building entrance, in the lobby and the teen lounge. To learn more about these and other recently completed Public Art Projects, visit our Public Art Projects page. To learn more about current City of Oakland Calls for Artists and other artist opportunities, visit our Public Art Calls For Artists page and sign up for email announcements with the link at the top of the page. In 1989, the City of Oakland adopted an ordinance authorizing the allocation of 1.5% of municipal capital improvement project costs to commission and acquire public art. In 2014 the City adopted a new requirement for .5% of residential or 1% of nonresidential private development project costs for freely accessible public art on site or within the public right of way. Public Art staff, with guidance from the Public Art Advisory Committee, administers these funds and provides vision, planning and project management for Oakland’s public art collection. Gifts of art offered for placement on City property are reviewed through a public process managed by staff for approval by the Committee and City Council. The Public Art Advisory Committee is an advisory body to the Office of the Mayor, Oakland City Council, and the City Administrator's Office on all matters related to public art in Oakland. Its members are appointed by the Mayor and approved by City Council. The Advisory Committee supports City staff in the development and operation of the City of Oakland's public art program. For more information, visit the Public Art Advisory Committee page. Develop and implement plans and budgets for all public art projects annually. Develop and maintain a list of potential jurors and panelists and develop a maintenance survey/work plan. Coordinate the selection of artists or artworks for the Public Art Program, with a majority of public art commissions awarded to Oakland-based artists (i.e., those with residence, studio or primary professional employment in Oakland). Serve as liaison between the Public Art Advisory Committee, City Administrator's Office, Mayor's Office, City Council and other City departments. Solicit funds from foundations, corporations and public agencies for public art projects in Oakland. provide opportunities for citizens and visitors to participate in, experience and understand the process for creation of public art. In 1989 the City of Oakland adopted the Public Art Ordinance (11086 C.M.S.) which authorizes the allocation of 1.5% of municipal capital improvement project costs for commissioning of public artwork. These monies are set aside in the Public Art Project Account for administration by Public Art Program staff. In 2014 the City adopted a new requirement for .5% of residential or 1% of nonresidential private development project costs for public art. In June of 2017, the municipal code was amended to adopt Chapter 15.78, Public Art Requirements for Private Development (13491 C.M.S.). The Public Art Advisory Committee reviews all public art projects funded in whole or in part by the City as well as projects proposed for placement in the Public Right of Way, and on City or Caltrans property. The proposal requirements are detailed in the policy documents listed below. The City charges an hourly fee for review facilitation and approval of these projects, as stipulated in the City's Master Fee Schedule, pages N1-N2, Economic and Workforce Development/Public Art Program. Please contact Public Art Program staff for further direction and with any questions.